EIGHT WEEK MENTORING: In the next 8 weeks, we will work together - you, me, and a few others - through setting up social media content calendars. Six (or more :) ) of them. )You are invited to join me in my private social media and online community mentoring tutorials - lets work together in building your social media plans and implementing them. These are a mix of live and recorded sessions - plus all sessions are recorded in case you can't make the live event. Community Crew members study hard, with me guiding them, and our goal is to optimise what we do on social media to grow our subscriber base, improve our engagement and build on our Call to Actions (CTA) so we can see a return on investment on our social media resources (time, people, money). LIVE/HOMEWORK/RECORDINGS A mix of live and recorded webinars with me, Laurel Papworth, walking you through a task each week to develop your social media undertakings. Downloadable worksheets. I will walk you through each worksheet each week, taking questions, then invite you to download the worksheet and fill it in, submitting it the next week. Be able to identify your Social Media Customer Avatars, Preferred Audience, Custom Audience, Lookalike (Facebook) etc so you can target content appropriately. 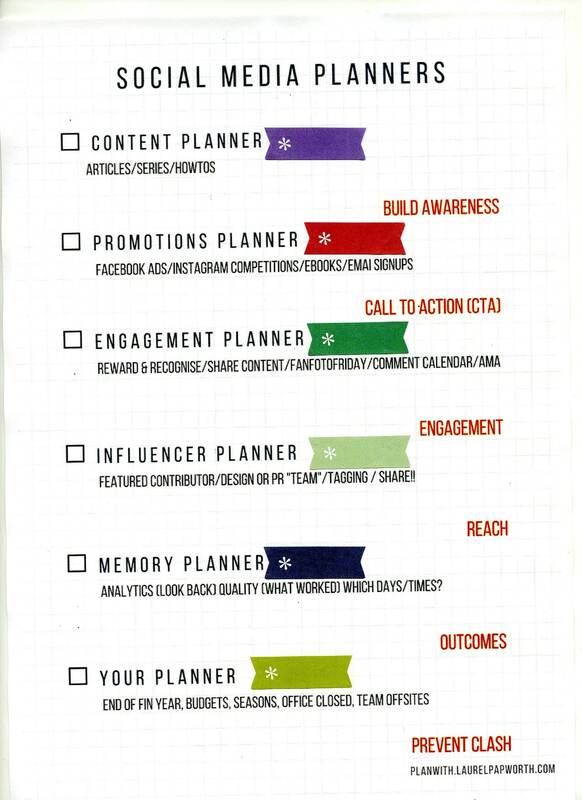 Create a Social Media Promotions Plan including competitions and Ads to promote Call To Actions amongst your community. Implement an Engagement Plan for greater input, sharing, comments and retweets from your community. Work together to create a Social Media Influencer Programmer Plan to create DT/PR teams in the community. If you prefer self paced learning (Community Club) that's fine, but that's not this course. Private one-on-one mentoring clients please go enquire for the Community Captain program. . Please note, if you are a member you will have longterm access to the recorded sessions, if you cancel membership before the end you will not. OPEN: It's best to sign up when the Membership is public, as the group sizes and times available are limited. Sorry but we do not add members once the course has started - too disruptive - but will waitlist you for the next small group. Remember: These are mostly LIVE sessions. Plus homework! Group LIVE Study Times: you will have access to me, within a private group. We work together and build our social media plans together. Yes there is homework. Some video lectures (usually Thursday 11 AM Sydney time) are livestreamed for around 45mins (more if I'm yabbering on but I'll try and keep it under an hour with questions), and there is an opportunity for questions regarding that tutorial. Any workbooks or cheatsheets for each lesson are included and you are invited to upload the results of your homework as images to the comments section or to a private dropbox. Catchup: can't make a session? You have LIFETIME access to the videos. They are streamed through a lecture in the curriculum and then made available as recorded material forever. FEE: If you sign up at $299 for the 8 weeks, that's $150 a month for a structured, live, mentored course. or around $38 or so, a week. Anyway you slice and dice it, great value! ! DATE: The Winter Pyjamas Group - next course starts on May 17th 2018 (enrollments will close a few days earlier or when the course is full). This course may run again in October 2018. If you wish to join the Spring Flowers Group in October, please email us. If you want to enroll more than one person, please use the last box in the enrollment section below and then let me know their details? (Name, email address and a mobile number in case of connection problems).